This Is The Life! is all about establishing your heart upon the foundations of God?s grace. Many Christians are frustrated, confused and defeated because they have learned erroneous things about God, themselves and the Christian life. This Is The Life! seeks to replace some of those faulty foundations with the truths of authentic, life transforming Christianity. About "This is the Life!" This Is The Life! is all about establishing your heart upon the foundations of God's grace. Many Christians are frustrated, confused and defeated because they have learned erroneous things about God, themselves and the Christian life. This Is The Life! seeks to replace some of those faulty foundations with the truths of authentic, life transforming Christianity. Ken Legg is the pastor of New Beginnings Christian Church on the Gold Coast. 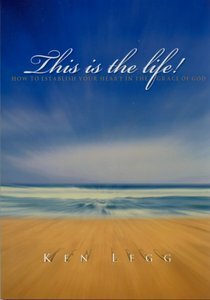 He has authored 16 books and Bible study guides, including This Is The Life, What's Eating You? and The Road Ahead. Ken's latest book New Covenant, New Glory, was written to help the reader discover and appropriate their inheritance under the new covenant. Ken is married to Marianne.